Committing to a long movie isn't always an easy task for me. When a movie's done well, the length doesn't matter and flows smoothly, but I still hesitate at the start. Similar to my choice of Once Upon a Time in America, I picked Amadeus because I needed to get over this reluctance. In this case, it was also a film that won eight Oscars, including Best Picture and Best Director. This was definitely a blind spot in my viewing background, so it was time to take the plunge. 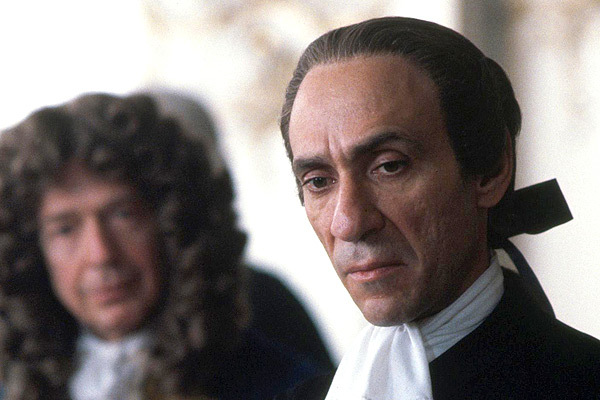 Composer Antonio Salieri (F. Murray Abraham) is a distraught old man meeting with a priest after a failed suicide attempt. During their conversation, he recounts his encounters with Wolfgang Amadeus Mozart (Tom Hulce) as he rose to prominence in Vienna. Salieri is jealous of the young star and works to undermine his success at every turn. Mozart has great talent but is an innocent, and he struggles against his demons while trying to make his name. Facing pressure from his wife Constanze (Elizabeth Berridge) and stealthy interference from Salieri, he enters a downward spiral that could lead to his end. On the surface, this story provides a look at the life of a famous composer, but its primary focus is the perspective of Salieri. His jealousy towards Mozart and anger towards God because of this young talent drives the story. We've all seen this type of person in our lives whose skills seem way too easy. Salieri can't get over the fact that an uncultured outsider can arrive and charm both the masses and the Emperor (Jeffrey Jones). This jealousy consumes Salieri and turns a fairly docile guy into a hypocritical monster. This personal approach makes the film more universal and not tied to a specific time period. We observe artists struggling to handle ambitions of greatness while facing the daily trials of life itself. This historical epic avoids the pratfalls of similar films because it provides the emotional resonance within the biopic structure. It's extremely difficult to deliver something original in a genre that's designed to hit the predictable notes. Audiences have certain expectations that have become so commonplace that it's easy for filmmakers to fall into those traps. This story avoids nearly all of those pratfalls by focusing on a secondary character and presenting Mozart from his perspective. Peter Shaffer wrote the screenplay from his own 1979 play, which took factual liberties to create the rivalry between the two composers. Decades after Mozart's death, Salieri is still haunted by his involvement in those past events. 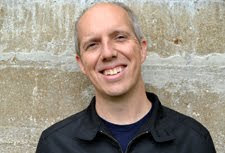 His loss and regret is intriguing and should connect to audiences of any era. Amadeus includes lengthy scenes presenting the opera and they're well-made, but those are the least interesting scenes in the movie. The best moments involve personal interactions between Mozart, Salieri, and the members of the emperor's inner circle. For his first appearance, he quickly outshines the veteran composer by rewriting his march on the fly. At this moment, it's clear that the proud Salieri will never accept the young upstart as a worthy composer. He views Mozart as an unholy aberration who doesn't deserve the grace of his natural talent. 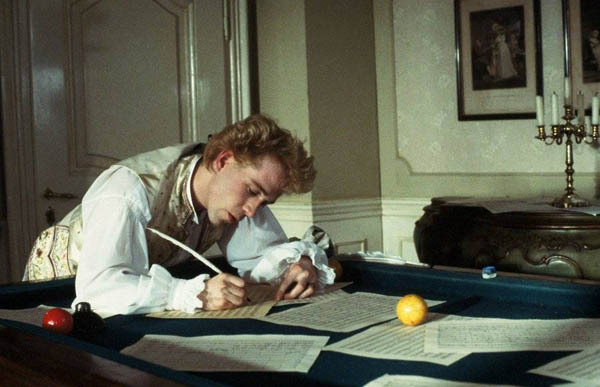 During this scene, Tom Hulce effectively conveys both Mozart's abilities and his lack of understanding about its nasty effects on Salieri. He's just having fun and showing his skills, but it's a slap in the face to a proud older man who's struggled to learn his craft. I'm generally resistant to this type of costume epic, but Director Milos Foreman (The People vs. Larry Flynt, Man on the Moon) makes it work because he balances the grand sequences with personal drama. Mozart's fate is truly tragic, and Foreman effectively presents the complicated relationship with Salieri that leads to his downfall. There are some lengthy on-stage moments that feel unnecessary, especially near the end, but that's a minor flaw when you consider this lively tale. Foreman's energetic direction makes even the complex, large-scale sequences surprisingly interesting. I watched this film at home and it was impressive, and this spectacle would have been even more remarkable on the big screen. Even though Amadeus runs nearly three hours, this response is a no-brainer. I would definitely check out this movie again before the album. I've yet to mention the Oscar-winning performance from F. Murray Abraham, which is totally deserved. Although he's worked steadily since this role, Abraham has rarely played such a remarkable character. He's essential to making this story work; we must understand his perspective while recognizing the flawed approach. Salieri never becomes a straight-up villain and showcases traits that exist in each one of us. 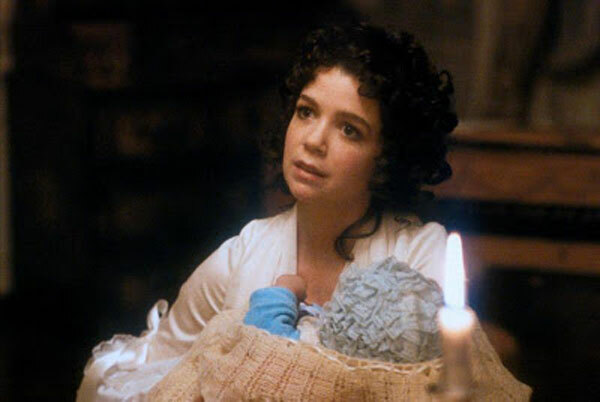 I should also mention Elizabeth Berridge's tricky role as Mozart's wife, which gives her little to do beyond worrying about money and his health. She performs solidly but isn't as fully developed as the two leads. Wow it is 3 hours? Strange how some films seem to be able to take you on a story with no tiredness or bum numbing boredom...and others do not!! Scott, I think it's actually like two hours and 40 minutes, but you're right that it didn't seem slow-moving. Some 90-minute movies seem longer. I saw this ages ago. I don't remember much about it anymore apart from the performances. I think F. Murray Abraham was really good in this, hence his Oscar win. Hi Ruth. 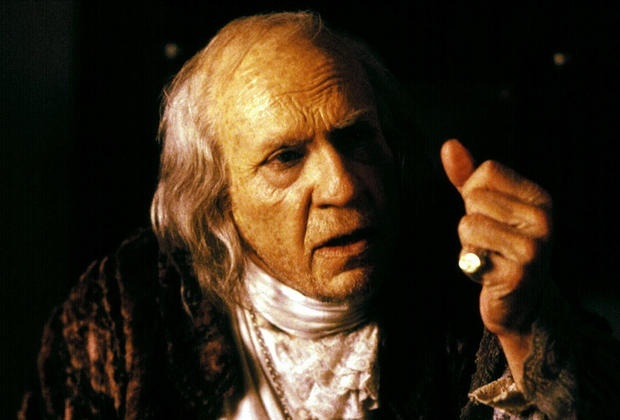 Abraham is the highlight of Amadeus and deserved the Oscar. On a side note, congrats on 700 posts! That's really impressive. I love me some Amadeus. Granted, I'm hugely biased, as I love Mozart and particularly adore his operas, but it's still a great film. A hugely inaccurate biopic, but a great film none the less. I do wish there was more of an examination of his operas (the thematic elements in Figaro and Magic Flute are particularly interesting and telling of his personality), but I also recognize that I'm not the average movie-goer, and that that would be a movie about Mozart, while this is much more a movie about Salieri. Mozart was a true genius, and despite the excellent portrayal here, I still think the full extent of it isn't captured. Then again, maybe it takes years score study and learning and forgetting and relearning his music to get a better picture of him (or his music, at least). I'll stop rambling now. Nice review, Dan. Glad you liked it! Kate, I was interested to read afterwards about all the liberties they took with the Mozart story. It's pretty much a fictional movie with some real people and situations thrown into the mix. I did find it interesting that they spent a lot of time showing the operas but not going as much into the creation process. You're right that it's a movie about Salieri, which was a surprise but still intriguing. Thanks! Smirnoff, that was a nice moment and a good example of the fun that Hulce brings to the role. Thanks! I worked with a woman who was putting her classical music degree to good use by writing computer programs for a shirt manufacturing company. She despised this movie because Mozart was a hero to her and she just did not like seeing him portrayed not only as human, but as unlikeable, too. I liked it a lot and for me the key scene was the one you mentioned where Mozart comes in and says that the music is not quite right and proceeds to fix it. You can see in Salieri's face that Mozart is dead to him at that moment. I also have to mention what might be the stupidest criticism I have ever read about a movie. I have actually seen this mentioned multiple times in regards to Amadeus - the fact that they spoke with American accents. People have written that the movie was ruined for them because they weren't speaking with the "correct" accents. The fact that these characters would not have been speaking English at all did not occur to these people, so it didn't matter what accents they had. When I pointed that out to them let's just say the reactions I got ranged from sheepish to "I will hunt you down and kill you" (I'm paraphrasing). Rewatched this a couple of months ago and like you say it's such a great movie. You really don't notice its length and the acting and makeup are very well done. Salieri is one of those characters that is very memorable. Chip - I think it's a stretch for some people because Amadeus is based on a play that took major liberties with history. I agree with you that the accents are just something that viewers have to accept. The writer is giving his own take on Mozart to portray some intriguing themes, and for me it worked really well. Nostra - I agree about both the acting and the makeup. Salieri is a classic character and truly chilling, especially when recounting the events as an older guy.